Inside a wire-festooned lab in College Park, Md., engineers and physicists are experiencing something like the pioneering days of computing in the late 1940s. That was a time when inserting a program was a laborious process, and success in factoring a small number stood out as a “moment to remember,” in the account of one witness. Such a moment occurred for the University of Maryland team in mid-2016, when it announced the first fully programmable and reconfigurable computer of its kind. What earned the researchers a cover story in Nature was that theirs was no conventional device but a quantum computer based on electrically charged atoms, or ions, that could run a variety of algorithms rather than just one. Though still in an infant stage, this new technology promises one day to revolutionize industries from artificial intelligence to medicine with processing power far surpassing today’s most advanced machines. The Maryland team, led by Shantanu Debnath of the university’s Joint Quantum Institute, is not alone in seeking, one small advance at a time, to create ultrafast computers and other cutting-edge technologies by harnessing what Einstein dubbed the “spooky” properties of subatomic particles, which can exist in multiple states and places simultaneously. A year earlier, a team led by Andrew Dzurak, a professor of electrical engineering at the University of New South Wales in Australia, fabricated the world’s first quantum logic device made of silicon. Physics World, the magazine of the U.K.’s Institute of Physics, judged it one of 2015’s top 10 breakthroughs. The University of Chicago’s Institute for Molecular Engineering has earned distinction for its research on quantum information technology. Google, IBM, Microsoft, Intel, and Lockheed Martin have also joined the quest, drawn by the theoretical possibility that machines could perform more calculations in a heartbeat than there are atoms in the universe. Lately, the research has taken on a space-race sense of urgency as quantum devices, once considered the stuff of science fiction, increasingly seem not just possible but practical. “The world is on the threshold of the next quantum revolution,” the National Science Foundation (NSF) recently declared in placing research on quantum behavior and quantum systems on its list of 10 “big ideas” worth investment. Adding to the momentum are security concerns: Computers that one day might speed drug development could also make short work of the algorithms that safeguard billions of daily banking and other sensitive online transactions. The National Security Agency has grown worried enough to shift strategy, advising companies last year that vaunted encryption algorithms no longer were secure and working with the National Institute of Standards and Technology (NIST) to invent new ones for the quantum era. NSA also is investing in quantum computer research, including partnering with the Department of Homeland Security to expand the National Centers of Academic Excellence programs in information assurance and cyber defense at some 194 colleges and universities. Ever since Charles Babbage designed the first computer in 1837, the quest to invent machines that could, as he wrote in his autobiography, solve problems “of great complexity” has propelled engineers deep into uncharted territory—and unfamiliar collaborations. Consider the world’s first automatic electronic digital computing device, the Atanasoff-Berry Computer (ABC). Built at Iowa State University from 1937 to 1942, the desk-size machine bears the names of its inventors: a professor of physics and the graduate student he hired with a bachelor’s degree in electrical engineering. Physicists and electrical engineers also teamed up to create the integrated circuit, while mathematicians produced some of the greatest programming leaps. Indeed, today’s muscular processors owe their existence to Alan Turing’s concepts of a stored-program universal computing machine. Many of society’s thorniest problems outstrip the time, money, or calculating capacity required to solve them. “Classical computing can only take us so far,” observed Ray O. Johnson, then Lockheed Martin’s chief technology officer, when establishing the Quantum Engineering Center at the University of Maryland, College Park in early 2014. He predicted “the next computational revolution” will emerge from applying quantum science—the nexus of engineering, information technology, and physics. Quantum computing, first proposed in 1982 by Nobel Prize-winning physicist Richard Feynman, draws on the bizarre behavior of atomic and subatomic particles to exponentially increase processing power. Quantum mechanics suggests that the universe is a fuzzy, uncertain place at its tiniest levels. Particles can exist in a state of flux, spinning in opposite directions or existing in two different places simultaneously. They also can get “entangled” or linked together, influencing each other instantaneously even if on opposite ends of the universe. Classical computers, including supercomputers such as IBM’s Watson, sequentially process binary bits of data expressed as zeroes and ones. These are represented by flicking switch-like transistors on or off. By contrast, quantum computers hurtle through calculations instantaneously, with each quantum bit, or qubit, able to represent data as both zero and one, permitting two simultaneous calculations. The more qubits, the greater the computing power. A two-qubit system, for instance, can conduct four different calculations, while a 300-qubit system could in an instant “run more calculations than there are atoms in the universe,” estimates Google research scientist John Martinis, the Worster Chair of experimental physics at the University of California, Santa Barbara. “It’s a radical departure from classical computing,” says Christopher Monroe, a professor of physics at the University of Maryland, College Park, who likens current research on quantum components to working with the first semiconductor transistors back in 1947. Computing is only the latest front in a string of revolutionary quantum advances. As Google’s Martinis notes, “Quantum physics is the background of many modern technologies, such as lasers and transistors.” Take lasers, whose intensely powerful beams of single-color, coherent waves of light are used to drill metal, read barcodes, and repair detached retinas. The technology would never have been developed had quantum physics not shown that atoms could be stimulated to emit light in a way that stimulates nearby atoms to emit more light in a chain reaction, and that all this light would be in sync, or coherent. Quantum physics also underlies the development of transistors—on-off switches made from materials that can act either as a conductor or an insulator to dictate the flow of electricity. Conventional electronics “take advantage of the ‘bulk’ quantum properties of, say, millions of electrons traveling through a semiconductor crystal,” explains Peter Turner, co-director of the Quantum Engineering Center for Doctoral Training at the University of Bristol in England. By contrast, quantum technologies rely on effects usually produced by isolating and controlling a single electron or other particle in very precise ways using laser beams, electromagnetic fields, or other mechanisms. In theory, quantum computers could ace complex problems that stymie even the strongest supercomputers, such as factoring numbers that are hundreds of digits long—an ability that could crack encryption systems used to protect banking and other online information. A quantum computer running the right “quantum algorithm” could easily calculate these factors. In 1994, Peter Shor, a professor of applied mathematics at MIT, came up with just such an algorithm, and for more than a decade, scientists have developed primitive quantum computers that can use Shor’s algorithm to factor numbers. In the latest advance in this line of research, published in the journal Science this past March, researchers from MIT and the University of Innsbruck in Austria reported that they had built a quantum computer that uses laser pulses to carry out Shor’s algorithm on five atoms, correctly factoring the number 15. Their system is designed so that more atoms and lasers can be added, creating a faster, more powerful device. Quantum computers have other potentially path-breaking purposes. For instance, they might simulate other quantum systems, helping scientists explore the behavior of complex molecules. Such research could lead to better drugs or solve such long-standing mysteries as superconductivity, the phenomenon where electricity flows through objects without resistance. One company, D-Wave Systems in Canada, was the first in the world to sell quantum computers. A number of other quantum computing start-ups are emerging as well, including University of Maryland spin-off ionQ, which is developing a trapped-ion quantum computer, and PsiCorp, founded by University of Bristol researchers, which is developing a photonic quantum computer using silicon chips. Quantum technology centers are sprouting up worldwide. Among the leaders: the Institute for Quantum Computing at the University of Waterloo in Canada as well as the Australian Research Council’s Centers of Excellence for Engineered Quantum Systems and for Quantum Computation and Communication Technology. In addition, China’s National University of Defense Technology in Changsha, which built Tianhe-2, for years the world’s fastest supercomputer, “is starting a very big initiative into quantum computing,” says Bertels. A major focus for researchers involves investigating different strategies to develop quantum technologies. Each platform has its own strengths and weaknesses, notes Turner, “and it’s the new quantum engineers’ job to meet this challenge.” That’s no small task. “Quantum phenomena such as superposition and entanglement are very fragile, lasting maybe a couple of hundred nanoseconds or milliseconds,” notes Bertels. “In isolated cases they can last seconds, but then we’re only talking about single qubits.” To account for that fragility, engineers must implement “all kinds of error-correction mechanisms,” he adds. For each “datum” or “logical” qubit in a quantum computation, dozens or even hundreds of other so-called “ancilla” or “physical” qubits may be needed as fail-safe redundancies. The easiest particles to coax into superposition and entanglement are usually very small, because their activity is easier to control, or very cold, because the less energy they have, the less likely such energy will disrupt these delicate states. These particles are usually also very isolated from their surroundings to avoid potential interference. Quantum engineers must learn how to preserve as much of this isolation as they can while still connecting these particles together in order to form useful machines. One approach uses ions as qubits, with each electrically charged particle trapped in a vacuum by magnetic fields. The first reprogrammable quantum computer that Maryland’s Debnath and his colleagues demonstrated used lasers to manipulate five ytterbium ions. Another platform attracting interest from industry uses superconducting circuits as qubits. In June, for example, Google developed a quantum computer from superconducting cross-shaped qubits made of aluminum film deposited on sapphire. Nine of these qubits were lined up and linked together by more than 1,000 circuits known as quantum logic gates. Each qubit resonated at a specific frequency; by tuning frequencies to or away from each other, interactions between qubits could be turned on or off. Google’s long-term strategy is to use quantum computers for machine-learning applications. This branch of artificial intelligence is devoted to creating computers that can improve with experience. “We want machine learning to look for patterns in large datasets, such as learning what certain objects look like in photos,” Martinis explains, noting that such machine-learning algorithms are really difficult. One advantage of this technique is that photons can communicate qubits over long distances, says Christopher Erven, co-director of the University of Bristol’s quantum engineering center. This can help lead to a “quantum Internet,” where quantum computers can share data to form more powerful networks. Challenges abound, however, including building devices that can reliably generate single photons on demand. “About 10 percent of the time, when we press a button, we get a single photon,” says Erven. “Other times, we get more.” Better single-photon detectors are also needed, he adds. The Quantum Engineering Center for Doctoral Training at the University of Bristol offers a four-year quantum engineering Ph.D. program. 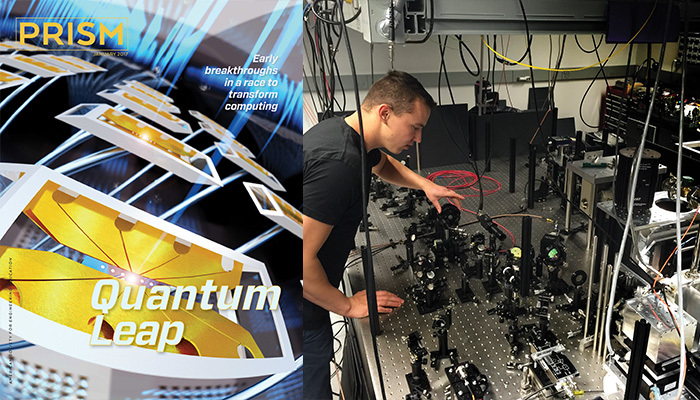 Students receive a year of training in quantum platforms, quantum information, quantum devices, quantum optics, and quantum algorithms, including seminars with experts working on superconducting qubits, ion trapping, or other quantum technology. “We feel that a quantum engineer should be familiar with all of these approaches,” says Turner, the center’s co-director. The first year also involves a laboratory component and two research projects for students to “test the water and see what aspects of quantum engineering” best suits them. Small initial cohorts of 10 allow the fledgling quantum engineers to build networks. “Students have nine other people who will go off into different areas of quantum computing and be friends for life,” notes Bristol’s Erven. The next three years involve conducting research at the University of Bristol, possibly in collaboration with partner institutions. The University of Bristol also houses what may be the world’s only quantum technology incubator. Founded in response to the sector’s lack of start-ups, the new Quantum Technology Enterprise Center offers additional training, networking, and support for 10 fellows per year who are interested in commercializing their work or starting a quantum technology company. Charles Q. Choi is a freelance writer based in New York.